As I wrote in an earlier sunblock reviews post, I once loved Solar Protective Moisturizer SPF 30 from DeVita. Then they changed the formula... and it was horrible. Since then, I've been searching for a replacement sunblock; more specifically, a facial moisturizer with SPF. So I moved on to trying other products. Most made my skin shiny, an effect I was trying to avoid. 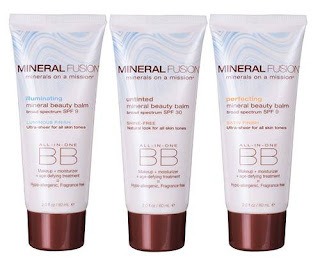 I managed to find one that I thought was worth buying: a BB cream from Mineral Fusion. The tinted version was too dark for my skin tone, so I went with the untinted version, which is SPF 30. It's not bad. It goes on with a white cast which disappears within a few seconds. It's not quite shine-free as the label touts, but it's less shiny than other SPF moisturizers I've tried. It also has some "age-defying" ingredients as a little bonus. It's just moisturizing enough for me to use alone for now, though I'm sure I'll need to layer it over a heavier moisturizer during the winter. That's typical for my very dry skin. I have been using it only intermittently because I don't leave home some days. It will get a better test once I'm wearing it all day every day. 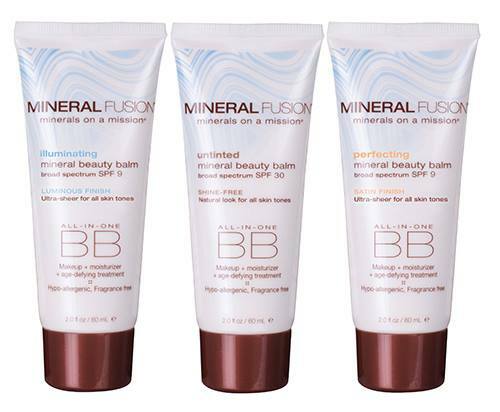 Mineral Fusion also makes a brush-on sunblock that I'm interested in trying. It might be a way to avoid the dreaded sunblock shine. SPF 30 blocks about 97% of UVB rays. SPF 50 gets you only one additional percentage point, with about 98% UVB blocked. SPF is a rating for UVB rays (which cause sunburn). It has little relation to the protection from UVA rays (which are linked to skin damage). Even if you're not getting a sunburn, you might be soaking up lots of damaging UVA. SPF ratings are based on wearing enough of the sunblock. And in this case, "enough" means "a lot." To get the full SPF, you need to apply about half a teaspoon just on your face. Thanks for the information about SPF. I've heard that they weren't as effective as they've claimed, but it is good to get the exact numbers. Too make matters even more complicated, there are studies coming out now about how UVB is essential for creating necessary vitamin D in the skin. Though there are no studies showing causation, there are a few that show low vitamin D levels found in people suffering from everything from depression to cancer. Unfortunately, sunscreen blocks the necessary UVB radiation from interacting with your skin. However, just never wearing sunscreen is not the full solution, because peak Vitamin D production only occurs when the sun is directly over head and then you only need 10-15 minutes to produce more than enough Vitamin D.
I don't have any real solutions, unfortunately. Just wanted to bring another aspect of the sunscreen question into the (sun)light. Great info on vitamin D, thanks! My doctor always asks me about my vitamin D intake. So far, she's been content to hear I take multi-vitamins and eat a fair amount of vitamin D and calcium-enriched foods. I sure hope it's sufficient... the idea of standing outside in the full sun mid-day makes me very uncomfortable! Multi-vitamins and healthy foods are excellent sources of Vitamin D. But there is something about Vitamin D from the sun that remains unique and necessary for our bodies. I'll look around for the study- or at least a more reliable expert than myself, but I highly recommend getting a bit of solar vitamin D.
Is there anyway to protect from UVA rays? Obviously covering up is one option, but not always suitable. I've heard good things about Calypso face cream, but I have no idea if it's any good or not. Chemical sunblocks are more complicated. In the US, sunblocks labeled "broad spectrum" block both UVB and UVA. However, the criteria for this label are very weak, so it's not much of a guarantee. 1. Their UVA protection must be at least 1/3 as strong as their UVB. For example, a 30 SPF must provide UVA protection of at least 10. 2. They can use newer chemicals that better block UVA. These are not available in the US because the FDA (Food and Drug Administration) hasn't approved them yet. Seems to me that European customers can get pretty good UVA protection in a chemical sunblock. US customers, not so much. Thank you! I didn't know that the criteria for sunblock in Europe was different from American, but I suppose with different regulatory bodies it makes sense. It seems ridiculous that so many double standards are at play in a relatively simple product; I will need to look out for better alternative and wise up next time I'm shopping for sun cream. As much as I slather myself up with sunscreen, I still find a parasol to be the best for blocking the sun. Even the best sunscreen stings when it gets it your eyes. A parasol is always a good choice... except when one is driving, of course. The first commenter is right about the vitamin D, I had a vitamin D deficiency and it's no fun. One of my friends had it so bad it was affecting her bones. No need to scare you though -- taking vitamin D vitamins routinely were enough to help me :-) I try to go outside . . . I have my mum's pale skin, so I get flushed easily, however I don't have any sunburns (yet). I use Olay Broad Spectrum SPF 15 moisturizer (I believe that's the correct name). It won't give you a dramatic, pale face but it'll make your face subtly paler over time with lots of use. Sometimes I'll go without foundation because most foundations that I've tried are sparkly (whyyy?) or clog my pores easily. If you haven't yet, I'd suggest trying Neutrogena Clear Face. It's oil-free and it feel less greasy and disgusting to me.